"Medium rare" redirects here. For other uses, see Medium Rare. Doneness is a gauge of how thoroughly cooked a cut of meat is based on the colour, juiciness and internal temperature when cooked. The gradations of cooking are most often used in reference to beef (especially steak and roasts) but are also applicable to lamb, pork, poultry, veal and seafood (especially fish). Gradations, their description, and the associated temperature ranges vary regionally from cuisine to cuisine and in local practice and terminology. For steaks, common gradations include rare, medium rare, medium, medium well and well done. The United States Department of Agriculture recommends an internal temperature of at least 145 °F (63 °C) for cuts of beef, veal, and lamb in order to prevent foodborne illness, and warns that color and texture indicators are not reliable. The same meats should be thoroughly cooked to 160 °F (71 °C) when ground or tenderized by cutting, since these processes distribute bacteria throughout the meat. The table below is from an American reference book and pertains to beef and lamb. The interior of a cut of meat will still increase in temperature 3–5 °C (5–10 °F) after it is removed from an oven or other heat source. The meat should be allowed to "rest" for a suitable amount of time (depending on the size of the cut or steak) before being served, which makes the meat easier to carve and its structure firmer and more resistant to deformation; its water-holding capacity also increases and less liquid is lost from the meat during carving. (p165) The whole meat and the center will also continue to cook slightly as the hot exterior continues to warm the comparatively cooler interior. 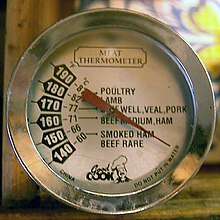 The exception is if the meat has been prepared in a sous-vide process, as it will already be at temperature equilibrium. The temperatures indicated above are the peak temperature in the cooking process, so the meat should be removed from the heat source a few degrees cooler. 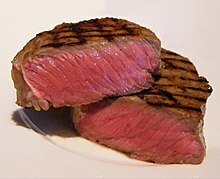 As meat is cooked, it turns from red to pink to gray to brown to black (if burnt), and the amount of red liquid, myoglobin (not blood), and other juices decreases. The color change is due to changes in the oxidation of the iron atom of the heme group in the myoglobin protein: raw meat is red due to myoglobin protein in the muscles, not hemoglobin from blood (which also contains a heme group, hence the color). Prior to cooking, the iron atom is in a +2 oxidation state, and bound to a dioxygen molecule (O2), with a red color. As cooking proceeds, it loses an electron, moving to a +3 oxidation state, and coordinating with a water molecule (H2O), turning brown in the process. Searing raises the meat’s surface temperature to 150 °C (302 °F), yielding browning via different reactions: caramelization of sugars, and the Maillard reaction of amino acids. Raised to a high enough temperature, meat blackens from burning. Well done cuts, in addition to being brown, are drier and contain few or no juices. Note that searing (cooking the exterior at a high temperature) in no way "seals in the juices" – water evaporates at the same or higher rates as unseared meat. Searing does play an important role, however, in browning, a crucial contributor to flavor and texture. ^ "Degrees of Doneness". Iowa Beef Industry Council. Archived from the original on 2016-03-24. Retrieved 2016-03-17. ^ Internal Color and Tenderness of the Infraspinatus, Longissimus Thoracis, and Semimembranosus are Affected by Cooking Method and Degree of Doneness. ProQuest. 2008. pp. 2–. ISBN 978-0-549-96484-1. ^ a b "Beef from Farm to Table" (PDF). U.S. Department of Agriculture, Food Safety and Information Service. February 2003. Retrieved 2016-03-17. ^ a b Green, Aliza (2005). Field Guide to Meat. Philadelphia, PA: Quirk Books. pp. 294–295. ISBN 1594740178. ^ McGee, Harold (2004). On Food and Cooking: The Science and Lore of the Kitchen. New York, New York: Scribner. ISBN 978-0-684-80001-1. LCCN 2004058999. OCLC 56590708. ^ McGee, Harold (April 20, 1992). The Curious Cook: More Kitchen Science and Lore. John Wiley & Sons. p. 339. ISBN 0-02-009801-4. The Culinary Institute of America (2011). The Professional Chef (9th ed.). Hoboken, New Jersey: John Wiley & Sons. p. 367. ISBN 978-0-470-42135-2. OCLC 707248142.